Mt Kagami is also called Hirefuri-yama, the Mountain of the Last Farewell. 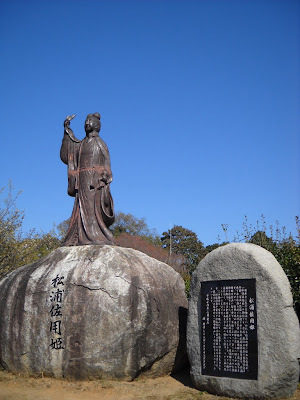 From here, Matsura Sayohime waved good bye to her husband. Her story is one of the three famous tragic legends in Japan. The mountain looks the same from any direction, having the same shape, so it is also called Shichimen-san, the Mountain with Seven Faces. It is only 284 m high. From its top, one can enjoy the magnificent view of Karatsu Bay.